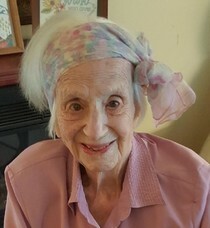 Bessie C. Maloy, 106, of Gaithersburg, MD passed away on September 8, 2018. Daughter of the late Henry and Charlotte Curtis. Wife of the late Raymond V. Maloy. Survived by her two children, Nancy Vert and Walter Lee Maloy. Also survived by several grandchildren and great-grandchildren. A Memorial Service will be held on Tuesday, September 18, 2018 at 11am at the Asbury Guild Chapel, 301 Russell Ave., Gaithersburg, MD 20877. A Graveside Service will follow at 1pm at Norbeck Memorial Park, 16225 Batchellors Forest Rd., Olney, MD 20832.